Funny how perfectly things work out. I posted about a Road Trips For Food (RTFF) that was heading down to Miami to a restaurant I wanted to try. As it turned out only one friend, Barb Francisco, was able to join me. As the date quickly approached, I starting thinking about Swine, from the 50 Eggs restaurant group that also includes Yardbird. I had been dying to get there, but just never got around to doing so. I have many foodie friends, but one of the many wonderful things about Barb is that she, as I, lives and breaths for delicious meals. I could not imagine a better person with whom to head down to Swine and I was thrilled that Swine had been on her ‘must try’ list, as well. The dining menu is right up my alley. Plenty of appetizers, sandwiches, salads, full plates and sides from which to choose and each one looked as delectable as the next. Their dishes are made with ‘sharing’ in mind and that is exactly what we did. The beef/chorizo meatloaf wrapped in bacon special and pulled pork Caesar salad were both delicious. The other dishes coming out from the kitchen were also calling to us, but we had an end game in mind…desserts. 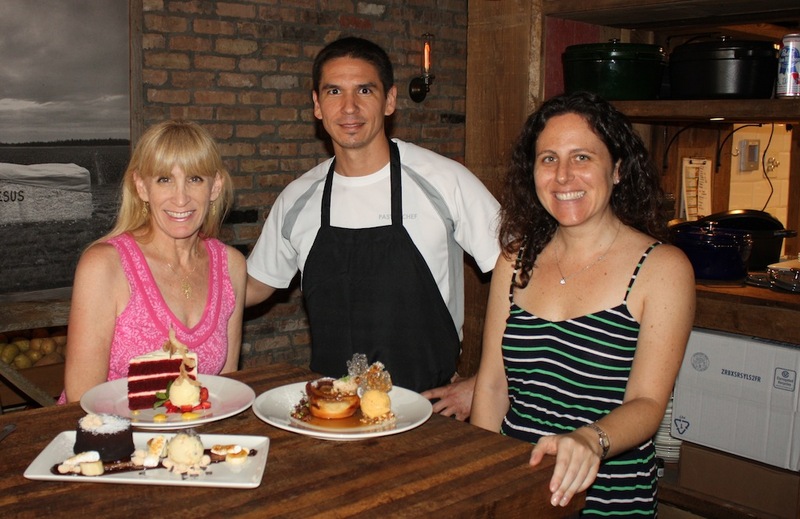 When we arrived, I asked about the dessert menu and we were told about a special that Executive Pastry Chef Max Santiago was preparing for dinner. I asked if it would be available to try earlier and, although disappointed with the answer, we both knew we were in for some amazing desserts. Chef Max came out to chat with us and he is delightful. There is something about talking with someone whose passion for what he does shines through. Max has accomplished many things professionally over the past 20 years, including but not limited to Corporate Pastry Chef for Norman Van Aken’s restaurants – Norman’s, Mundo New World Café and Cary’s Fort, as well as working at the Peninsula Hotel in Beverly Hills. I asked Max which desserts were his favorites and the first one he named was the Red Velvet Cake, one of the desserts that Barb and I had initially thought we would not order. Yet Max described the way each layer of cake is perfectly balanced with the cream cheese buttercream and then plated with vanilla bean ice cream, strawberry-thyme jam and lemon curd. As if this were not enough, we also learned that Max cracks open coconuts, scoops out the flesh, grates it and tosses it in a cinnamon sugar mixture before baking the flakes. Everything that Max sends out of the kitchen has been made in-house. Red Velvet may not have been my first choice, initially, but WOW it was incredible. The strawberry-thyme jam is a combination I will want from now on with my Red Velvet Cake. Another of our must-have desserts was the Warm Sticky Icky Bun, with maple-bourbon toffee syrup, pecan butter that is spread over the sticky bun, candied smoked bacon and “sweet potato pie” ice cream. How did these flavors work together? Beyond beautifully. The individual components were delightful, the combination, outrageous. It was not surprising to learn that Max has a passion and gift for plating as evidenced by each dish we were presented. Our third dessert was the Molten Chocolate Peanut Butter Cake, with torched bananas and marshmallows and Chunky Monkey ice cream, plus this incredible peanut mixture, that looked like little balls but was, actually, very flaky and delicious. The molten name suits the dessert perfectly and the oozing factor had the two of us diving in for more. As if three desserts were not enough for two people, remember that dessert that was going to be featured on the dinner menu; the one that was not yet set to serve? Well, Max surprised us with a variation of the dessert and presented it to us in a beautiful round glass. Picture this, starting at the bottom…a layer of milk chocolate peanut butter with corn flakes, topped with a chocolate ganache with roasted peanuts layer, topped with a salted caramel layer, with chocolate sabayon piped on top. Seriously, stunning to look at. As I was trying this last dessert for the first time, Barb was asking me a question. I finally had to look at her and say, “I need a minute!” Biting into this dessert truly takes me to a happy place that is reserved only for the finest of foods. My favorite desserts have always included a variation of textures and this one worked, magnificently. The crunch of the cornflakes and the peanuts with the creaminess of the salted caramel, ganache and sabayon were delightful. Beyond that, though, was the taste. Each flavor, on its own, was exceptional. Together, Max’s creation was brilliant. I learned that 50 Eggs is very close to signing the papers on a restaurant in Las Vegas, one of my favorite food cities. There is only one problem with this; Max’s dream location is Vegas. Without the humidity of Florida the city that never sleeps is a pastry chefs dream place to work. Barb and I left the restaurant knowing we will be going back, soon. Finding a restaurant that offers as many choices as Executive Chef Phil Bryant’s, servers as pleasant as Sasha as well as an Executive Pastry Chef as talented as Max is a very difficult task. We had better make sure we hurry, though, before Vegas gets the best hand dealt to it with Max’s arrival. Disclaimer – I think it only fitting that Chef Max be recognized for something that he did that was well beyond the call of duty. And I’ll preface it by saying that every commendation written above was spoken from the heart (and our taste buds) without a single thought being given to his generosity. Much to our total shock, we discovered when we asked for our bill, that every single dessert in which we so delighted, was a gift from Max. To say that it was appreciated would be the understatement of the year. An added bonus to as fine a meal as we could ever hope to eat. Well, as always, you perfectly captured our experience. And yes it was not lunch, but an experience. From the food, to the service and best of all our time with Chef Max, it was a day I will not soon forget. Betsy, thank you so much for including me on all of your culinary adventures. I cannot wait till the next one! You made the day complete and I thank you for always being a food adventurer!! Swine was exceptional! An absolute must on my next trip to Florida. The restaurant looked as charming and as inviting as could be, even without any mention of the food. Thanks for such a wonderful recommendation. I know the wonderful people at Swine will take great care of you when you visit. Kimberly, I am ALWAYS ready to go back to Swine! Let me know when! Thank you , loved it all !!!! Thank you Jeri for letting me know. Can’t wait to have you guys back again! I’m still rockin’ along, each day, coming up with new desserts to WOW my guests with! Please feel free to reach out to me when coming back in town and I will make sure I’m there to take special care of you again! It was my absolute pleasure to write about how amazing you and your incredible desserts are. I can’t wait to get back to Swine and I will most certainly touch base with you. I know that Vegas is tempting you, so I had better get back there soon!